Hailing from Asia, the eggplant has steadily gained popularity around the world, and now it is a staple in many countries, providing not only essential nutrients but also medicinal benefits. 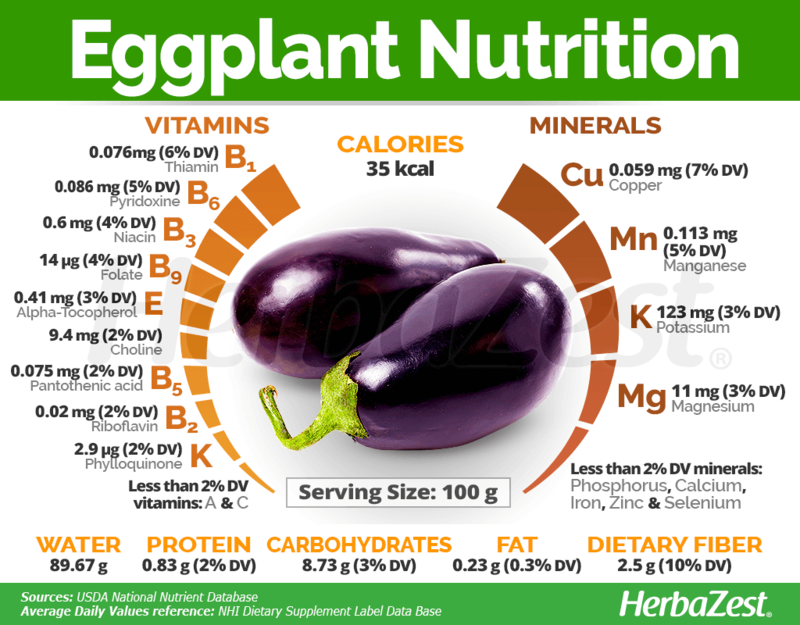 Learn more about eggplant and how to add it to a healthy diet. Eggplants were once rejected for consumption by the vast majority of society due to popular beliefs that this fruit caused insanity, cancer, leprosy, and other diseases. Since the development of different varieties without the bitter taste, eggplants are now being eaten and used worldwide for their many health benefits and medicinal purposes. Lowering cholesterol. By regulating cholesterol levels, eggplants are able to help reduce lipids, thus preventing metabolic conditions, including cardiovascular diseases and high blood pressure. Fighting infections. Flavonoids within eggplants help boost immune system activity and promote anti-inflammatory action. Preventing degenerative diseases. The antioxidants present in eggplants help protect brain cell membranes from free radical damage and also help rid the body of excess iron, ultimately preventing cell damage that could lead to degenerative diseases. Moreover, eggplants are diuretic and low in calories, which makes them helpful for those wanting to lose weight and keep it under control. Nasunin, responsible for the dark purple color of the eggplant skin, is a powerful antioxidant with antiviral and anti-inflammatory properties. It boosts the production of cytokines, which are small proteins that work with cells to help regulate immune responses and strengthen cell membranes. Nasunin also protects brain cell membranes from free radicals. Unstable and highly reactive free radicals wreak havoc at a cellular level, disrupting the immune system and potentially causing serious cerebral damage over time. Moreover, nasunin helps get rid of excess iron in the body. While iron is responsible for normal immune function and proper oxygen transport, too much of this mineral in the body increases free radical production. By binding to excess iron, nasunin prevents blood toxicity, as well as cell damage that could lead to serious diseases. 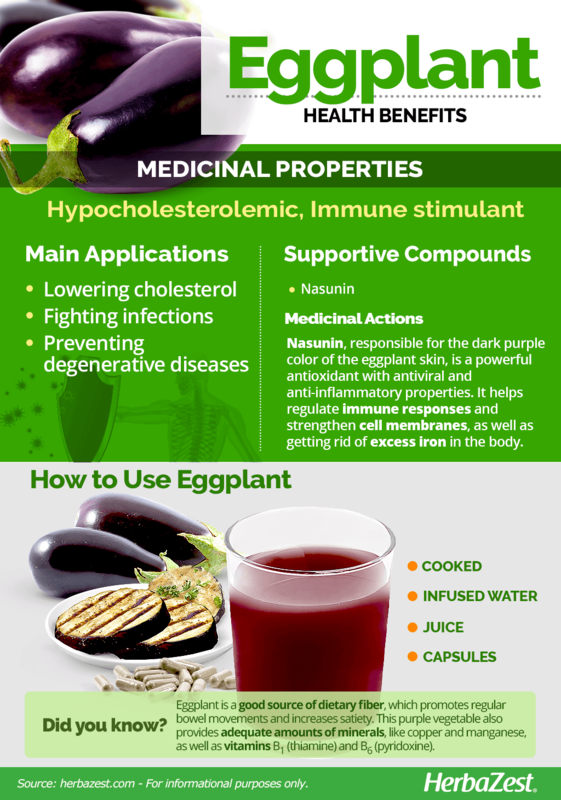 NASUNIN, AN ANTIOXIDANT FOUND IN EGGPLANT SKIN, HELPS PROTECT BRAIN CELL MEMBRANES. Other herbs with great antioxidant qualities are acai and blueberry, while avocado and olive also help reduce cholesterol. Raw eggplant contains the toxin solanine, which is also found in potatoes and can be poisonous to some animals, but rarely to humans. However, it is recommended to cook eggplant before consuming it. Seek immediate medical attention if solanine toxicity from consuming eggplants is suspected. Symptoms generally affect the stomach, intestines, and nervous system and include nausea, diarrhea, and headaches. 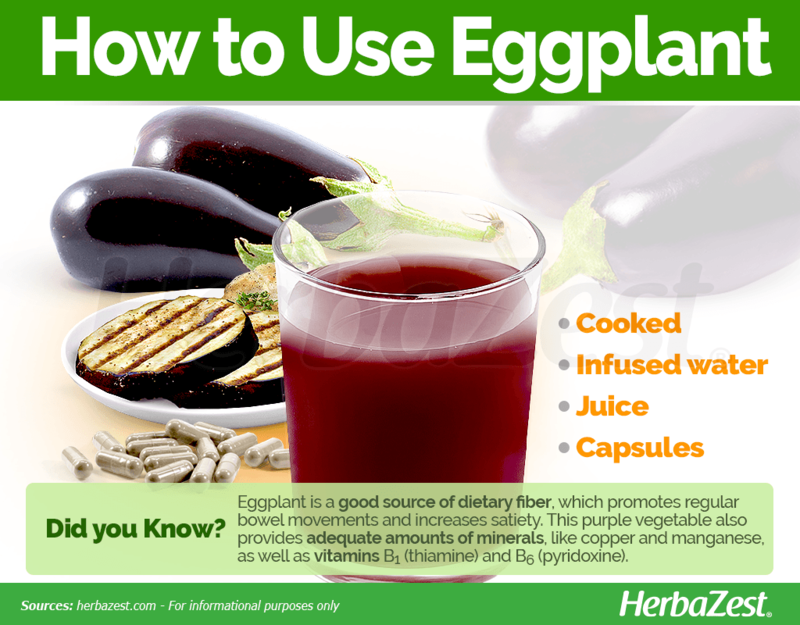 Eggplants contain a substantial amount of a natural substance called oxalate. Those who have a history of oxalate-containing kidney stones should consume eggplant in moderation. Although there are no studies to prove the accuracy of the following statement, it is widely believed that a reduction in consumption of food that belongs to the nightshade family will assist with arthritis symptoms. Thus, those who have aggravated arthritis may benefit from limiting or avoiding bell peppers, tomatoes, potatoes, and eggplants. Nitrates are a naturally-occurring form of dissolved nitrogen that convert into nitrites when cooked and react with the amino acids in the stomach. Although broccoli and eggplant contain relatively less nitrate than spinach and amaranth, there is a risk of exposure. Nitrates may be dangerous for infants younger than four months, who can consume eggplant in moderation but never when it has been left at room temperature. The symptoms of nitrite poisoning include lack of oxygen (bluish lips), difficulty breathing, nausea, diarrhea, vomiting, dehydration, fast pulse, dizziness, weakness, coma, and/or convulsions. When it comes to daily recommended intake, 100 grams of cooked eggplant provides about 10% of dietary fiber, which promotes regular bowel movements and increase satiety. Eggplant is also an adequate source of copper, manganese, vitamin B1 (thiamine), and vitamin B6 (pyridoxine), all of which promote many bodily functions, from cells metabolism, to bones, nerves, and muscle health. Additionally, eggplant provide small amounts of other nutrients, such as potassium, magnesium, vitamin B3 (niacin), and folate. 100 grams of cooked eggplant have about 35 calories and 10% of the daily value for dietary fiber. Eggplant is a staple food, and can be consumed, with or without the skin, in a variety of ways. However, the medicinal properties of this plant can be obtained from remedial forms. Cooked. Stuffed, grilled and roasted, stir-fried, or baked, there are many ways to consume eggplant and take advantage of its digestive and nutritional benefits. Infused water. Due to the high vitamin, mineral, and antioxidant content, drinking eggplant water is believed to assist in weight loss. Keep a healthy, balanced diet in addition to regular exercise for weight loss. Juice. This fruit's juice is widely known for helping with heart health as well as lowering cholesterol levels. Capsules. 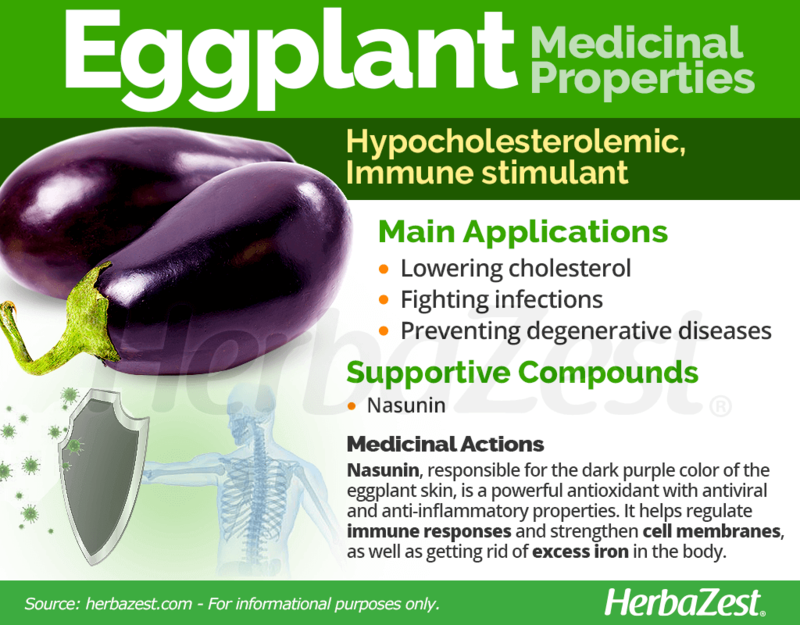 Consumers take eggplant pills to better control cholesterol and lipid levels. Before beginning any supplement plan, consult with a trusted medical professional. Eggplants in North America can be purchased year-round; however, their peak season takes place during August and September. Eggplants are simple to purchase at grocery stores and supermarkets, as well as farmers' markets. Other eggplant products, such as juice and cream, can be found in specialty health stores or through online retailers. EGGPLANTS CAN BE PURCHASED YEAR-ROUND. Eggplant capsules are readily available at specialized health stores and can be purchased o through online retailers, which usually offer a wide variety of brands and different concentrations. Eggplants are tender annual plants that are ranked as moderately difficult to take care of. Aside from their health benefits, the elaborate-looking produce and plant foliage make these fruits a great aesthetic addition to anyone's garden. Eggplants are a warm-season plant that does not grow well in hot, humid weather. Eggplants are propagated by seeds that can be safely stored for four years. Plants should be grown for eight to nine weeks in a heated plastic or glass house before moving them to a field. Seeds germinate rapidly at 70 - 90°F (21 - 32°C). The time to emergence averages around 7 - 10 days at 85°F (29°C). It is best to transplant them two to three weeks after the last frost, as cold will kill these plants. This fruit grows best in well-drained, sandy loam or loamy soil that is high in organic matter. Eggplants have moderate moisture needs. At least an inch (2.5 cm) of water per week to soak the soil during the growing season is recommended. Eggplants need full sun in a long, warm growing season that spans two or more months. Once transplanted, nighttime temperatures should be around 70°F (21°C). Detailed information about growing eggplant can be found in the herb garden section. The eggplant grows to a height of two to four feet (60 - 120 cm) tall with the same spread measurements, similar to a tomato on a vine. The flower color is purple with a bloom time in mid to late summer. It grows upright with the dark green foliage that has a coarse texture. Aside from the traditional oval, purple, and glossy ornamental fruit, some varieties produce long, thin eggplants or small, ball-shaped fruits. They even grow in colors such as orange, green, and white. Inside, these fruits carry small (2 mm), brown and flat seeds. Although it is commonly referred to as a vegetable, an eggplant is botanically called a fruit. Eggplant - also known as brinjal or aubergine - is part of the Solanaceae or nightshade family, which comprises about 2,700 species of flowering plants, including economically important crops, such as tomato (Lycopersicon esculentum), potato (Solanum tuberosum), and cayenne (Capsicum anuum); medicinal herbs, like ashwagandha (Withania somnifera); and fruits, like goldenberry (Physalis peruviana), and goji berry (Lycium chinense). There is a myriad of cultivated varieties of eggplants in North America. However, some recommended varieties include 'Black Beauty', 'Epic', 'Early Bird', 'Dusky', and 'Imperial'. 'Epic', 'Dusky', and 'Imperial' are bred to resist tobacco mosaic virus, which is commonly encountered on transplants. 'Black Beauty' is mid-season variety suitable for fresh market and home garden, and 'Early Bird' is a very early producer. Several other varieties are bred to resist to common diseases as well. Eggplants are not native to North America, as they were originally discovered in Asia. The large-fruited cultivated varieties are indigenous to India, with the smaller-fruited ones being from China. Eggplants were later brought to the Western Hemisphere by European explorers. Until the 18th century, eggplants were used ornamentally more than they were consumed due to their bitter taste and, subsequently, bitter reputation. Once new varieties were created, these negative attributes were not as present in the new breeds. Nowadays, eggplants are cultivated worldwide, but China is the leading producer, followed by Turkey, Italy, and Japan. In the United States, the main producer is Florida. Almost all of the eggplants grown in the United States are put up for the fresh market. The remaining 2% is used for frozen entrees, appetizers, and specialty dips, among other products. After Florida, the leading states for eggplant production nationally are New Jersey and California. Florida has year-round production and produces 30% of the U.S. crop. New Jersey is the second largest, with harvests from July through October. California produces 19% of the nation's eggplants, with seasons from April through December. In 2012, an estimated 156.3 million pounds (69.7 million kg) of eggplants were grown. 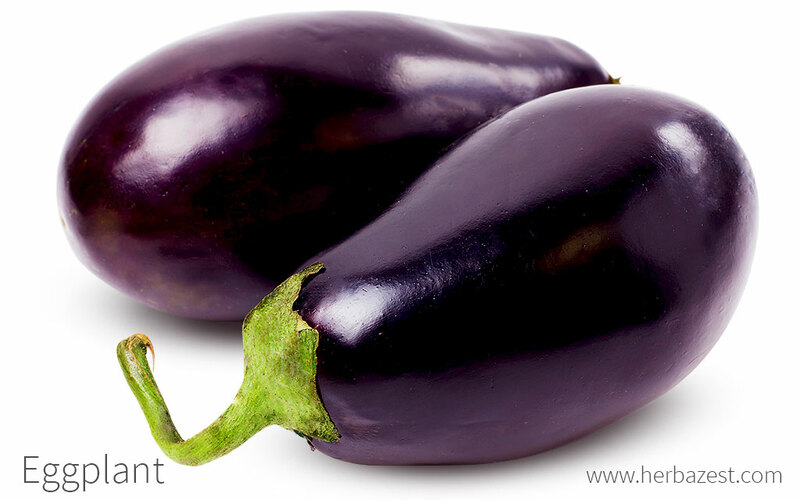 Moreover, the countries who export the most eggplants to the United States include Mexico, Honduras, and Guatemala. Main exportation from Mexico happens from January through March. Dye. Nasunin, the main antioxidant found in eggplant skin, works with other anthocyanins to give the eggplant fruit its purple color. This compound has proven useful as a colorant in textile, food, pharmaceutical, and cosmetic products as a natural dye. Eggplants have steadily gained popularity and praise throughout the past hundreds of years. Incorporating this famously purple fruit into a diet or everyday lifestyle provides the consumer with a myriad of vitamins and minerals to nourish the body. Consuming eggplants also helps protect cell membranes and fight inflammation, among other bodily functions.